My review copy: Received from the publisher via Edelweiss in exchange for an honest review. She stared, didn't know what to do. She didn't dare touch him, not when he was trying to drive the car. Tears began to roll down his cheeks. He dabbed at them absently with the sleeve of his hoodie. After a few long, horribly awkward minutes, he turned to Lucy. Through his tears a smile of pure astonishment transformed his face. "I'm okay, Lucy. I'm completely, totally clear!" Emancipated was a very pleasant read. It's a great new teen drama with elements of mystery, romance and comedy. The story focuses on a group of 6 teenage kids who, for many different reasons, become emancipated and end up living together in a Venice Beach house. Each one of these kids comes with unique baggage and from unique background, and they all have secrets to hide. They're quite an eclectic bunch, too. There's a local tennis star dreaming of becoming a lawyer, an actress-wannabe, a wallflower girl, a recently orphaned gay boy, a young app-creating tech-whiz of Mexican heritage and a rising punk music star. As these kids move in together and slowly get to know each other, their problems, secrets, hopes, dreams, fears and the masks they hide their true selves under are placed under a magnifying glass and closely examined. Some of them need help, some can't stop lying, some have ulterior motives, and some are downright dangerous. While the characters were pretty stereotypical (jock, drama queen, artsy girl, troubled kid, etc), I still found myself pretty much wrapped up in their stories, enjoying the alternating points of view and the way their lives intertwined with one another in fascinating, often times completely unexpected ways. The plot, while perhaps not very deep or strikingly substantial, was pretty well thought out. And the jigsaw puzzle construction worked really great here. Some parts were pretty predictable, yes, but overall the story was evenly paced and quite suspenseful, with short, dynamic chapters and entertaining dialogues. This is, basically, a story about growing up too early and living the adult life entirely on your own, dealing with family problems, facing your fears and confronting your past, pursuing your dreams and finding yourself. It's a contemporary drama spiced up, with a possible murder mystery. A story of love, friendship, strained family relationships, betrayal, deception, manipulation and lies. And as far as teen dramas and mysteries go, it's a pretty solid one. 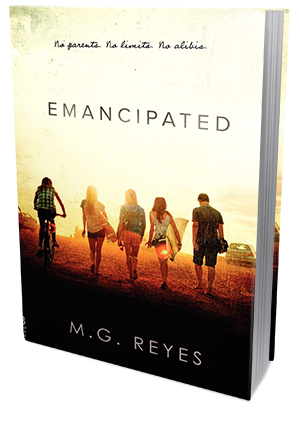 I had a great time reading Emancipated and I think fans of Gossip Girl and Pretty Little Liars will probably like it, too. This book would make a great TV Show for teens.